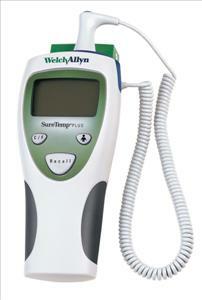 Welch Allyn® SureTemp® Plus 690 Thermometer Delivers Oral Results in Just 4 Seconds. This electronic thermometer is easy to use, compact and dependable. It delivers oral results in 4 seconds, axillary temperatures (for children under 4) in 10 seconds and rectal temperatures in 15 seconds with the use of an optional, interchangeable probe. Large LCD display features Fahrenheit or Celsius readouts and last temperature recall. SureTemp Plus 690 This affordable thermometer is ideal for alternate care environments. Three 1.5Vdc AA batteries provide 6000 readings. Automatic probe cover ejection; two-year limited warranty. Oral/Axillary Thermometer.